If you love hunting and you've always wanted to know what it would be like to hunt a buffalo--just like in the days of the wild west--our hunting reserve in Peoa Utah is the place for you! At Hi Mountain Outfitting, we know that for many people, hunting a bison will be something they never forget. If you can't wait for an authentic hunting experience with an established hunting outfitter, we have reservation forms available for download on our Hunting Reservations page, which you can print out and mail to us to. Otherwise, feel free to look around and see what we have to offer or contact us with any questions you have regarding our guided hunting tour. A proudly owned family business, we have years of know-how as hunting guides, helping our visitors during their very own buffalo hunt. As part of our commitment to be the best hunting outfitter in Utah, we are excited to make your hunting experience memorable. We have a small town attitude, but big time service and are willing to do whatever it takes as your hunting guides to make your buffalo hunt a success. Additionally, we love the chance to get to know each one of our visitors, and will do all we can to make sure hunting your own buffalo is everything you want it to be. We know that hunting is not just something you do, it’s a part of who you are. Unfortunately, hunting a bison or a buffalo is a dream that will be out of reach for most hunters. The scarcity of hunting tags for public buffalo herds makes it nearly impossible for the average hunter to win one at auction, unless you have a quarter of a million dollars to spare. So if that’s the bad news, what’s the good news? Thanks to our private herd, we are able to offer the chance to hunt a buffalo for much less than you would have to pay in order to hunt on public land. Additionally, we don’t have a limit as far as how many buffalo you can hunt. If you want two or three different bulls, we’re happy to provide you the opportunity. Hunting a buffalo will be something you never forget and never regret. To help you get a better idea of what your buffalo hunt will be like at our Utah hunting reserve, we also have a few pictures in our gallery for you to look at. We had a great time! Looking forward to our next hunt with Hi Mountain! 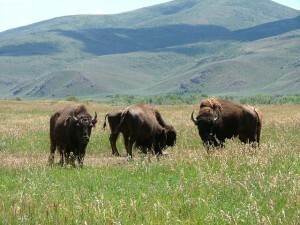 Thanks to all of at Hi Mountain for a wonderful buffalo hunt!